Germany has made a formal commitment to phase out the use of nuclear power by 2022. Erik Gawel and Sebastian Strunz write on the implications of the strategy for Germany’s future energy mix and whether the approach adopted in the country could function as a model for other European states. They argue that while the target is undeniably challenging, long-term it is both economically sensible and feasible to phase out both fossil fuels and nuclear energy in favour of renewables. Political responses to climate change and other negative consequences of conventional energies within Europe (e.g. oil spills, radioactive waste, open pit coal mining) are highly diverse. While the UK is promoting nuclear as a carbon-free energy source, for instance, Germany has embarked on a completely different path with its plan to phase out nuclear energy altogether. What is the background of Germany’s phase-out decision and how sensible is it from an economic point of view? In order to fully answer this question, several aspects need to be acknowledged. First, the phase-out is no impulsive reaction to the Fukushima incident, which came out of the blue. Germany’s powerful anti-nuclear movement dates back to the 1970s; it bred the Green Party which entered the Parliament in 1983 and ascended to the government in 1998 by forming a coalition with the Social Democrats. In 2000 this centre-left coalition put a nuclear phase-out into law for the first time. The early 2020s were identified as the target date for a nuclear free energy system. While subsequent revisions of the law have changed the specifics, the currently stipulated year for the last plant to be shut down, 2022, is well in line with this original perspective. Thus, the phase-out project has always been crafted as a long-term and step-wise process. Second, the Fukushima disaster effectively killed the narrative that nuclear power was necessary as a ‘bridging technology’ toward a renewables-based energy system. While conservatives had previously argued in line with this logic (and the government led by Chancellor Merkel in 2010 diluted the first phase-out law from 2000 by extending the running times of nuclear plants), they reversed their position after Fukushima. The most immediate consequence of Merkel’s shift on nuclear was the prompt shutdown of seven nuclear power plants in spring 2011. Due to overcapacities, this drop has neither proven to be problematic for the security of supply (contrary to the conservatives’ claims before 2011) nor has it led to an enduring increase of wholesale prices or a requirement to import foreign nuclear power. In fact, Germany is still a net exporter of electricity. Third, Germany is not alone in phasing out nuclear power. 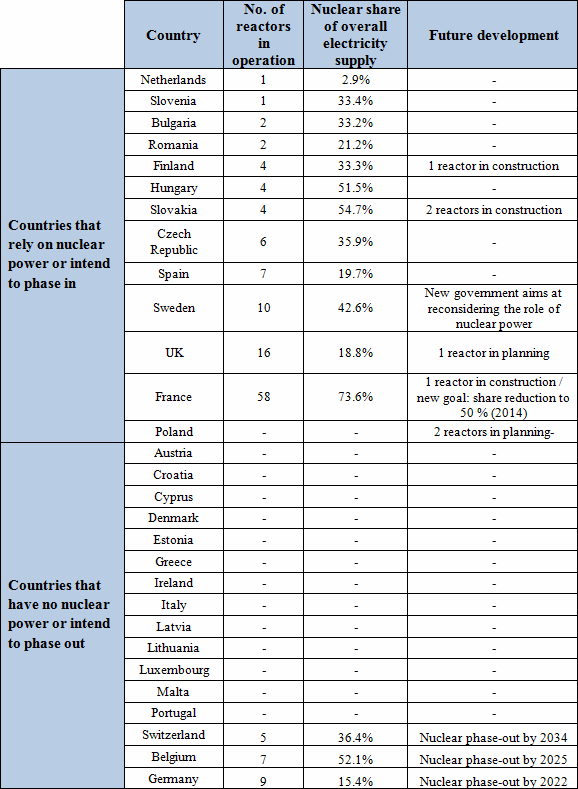 As can be seen from Table 1, there are several countries in Europe that do not rely on nuclear power or have also declared their intention to stop nuclear energy production. While some of the countries without nuclear are smaller EU member states, it is noteworthy that Italy, another highly industrialised economy and member of the G7, has already phased out nuclear power in 1990. The highly diverse picture of nuclear energy in Europe becomes complete when the huge differences in nuclear-shares among countries are considered, as well as the fact that countries such as Poland intend to enter this form of energy. Note: Full information is available here. For an explanation of the current situation in Sweden see here. Against this background, the main challenge of Germany’s Energiewende arises from the coincidence of both decarbonisation and nuclear phase-out. In 2000, Germany produced 577 TWh (terawatt hour) of electricity, of which 90 per cent came from fossil-nuclear energies. The aims of the Energiewende imply that by 2025 this fossil-nuclear share needs to be decreased to 55-60 per cent (to 20 per cent by 2050). While this is an extraordinary challenge, it may very well be doable: from 2000 to 2013, the share of renewables in Germany’s overall electricity production has increased from 7 to 24 per cent, as shown in Table 2 below. Projected increases of renewable electricity production to about 35 per cent at the beginning and about 45 per cent in the middle of the 2020s will exactly offset the simultaneous reductions from nuclear power plants going off the grid. Furthermore, the long-term targets for 2050 are not only to be achieved through a build-up of renewables, but also by significant energy savings (a 50 per cent reduction of primary energy consumption and 25 per cent reduction of gross electricity consumption). Note: Figures are rounded to one decimal place. Source for 2000 and 2013 percentages is AGEB; predicted future percentages are based on the latest official renewables targets. Is Germany a role model or an outlier? 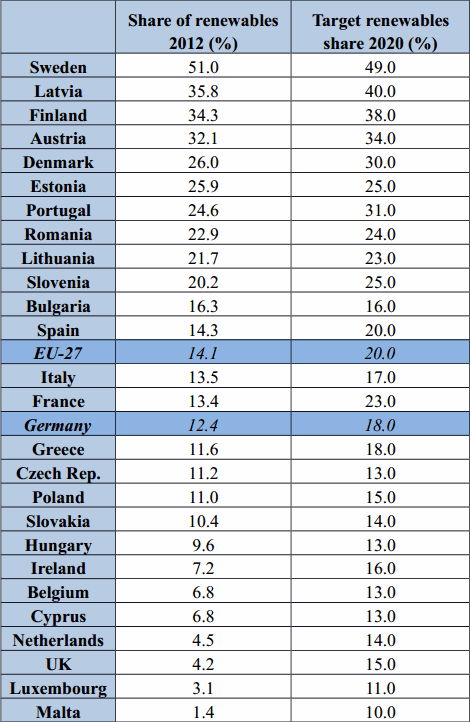 As Table 3 shows, Germany’s renewables targets within the EU 2020 framework actually lie below the EU average. This also holds for the share of renewables as part of overall energy consumption. So it is wrong to claim that Germany has again embarked on some kind of Sonderweg. On the contrary, Germany seems rather average in the short run. As mentioned above, the share of renewables as part of Germany’s electricity production already sits at almost a quarter – twice as high as the renewables share in overall energy consumption. In other words, Germany’s Energiewende should – currently – more correctly be called electricity transition because it focuses heavily on the electricity sector. In the short run, the nuclear phase-out strengthens this emphasis on electricity. Note: Full figures available here. In the long run, Germany’s objectives for the Energiewende imply that the perspective will have to be broadened to encompass the housing and transport sectors as well. Also, note that reducing energy consumption as planned would contribute significantly to the overall decarbonisation effort, thus alleviating pressure to build up renewable capacities. In the EU-context, Germany’s manifold and ambitious long-term targets by 2050 are remarkable, but cannot be readily compared because most Member States lack such elaborate long-term perspectives. There are, however, at least similar long term decarbonisation targets. Taking the EU energy roadmap 2050 as a point of reference, Germany’s energy transition targets fall well in line with the general tendency of the EU’s energy policy. Is nuclear power a necessary part of a future energy mix? All things considered, is nuclear power necessary for decarbonising the energy supply while also ensuring security of supply? The German experience shows that renewable energies may contribute major shares of the electricity supply – without jeopardising energy security in a highly industrialised economy and even under challenging natural frame conditions in Germany for renewables, provided that there is a long-term transition perspective and a stable political consensus. Moreover, it may be questioned whether the long-term risks associated with nuclear power really fit the requirements of any sustainable energy system which demands being more than simply carbon-free. But even apart from such sustainability issues, the apparent need for heavy subsidies to render new nuclear plants economically viable undercuts the claim that nuclear is cheaper than renewable energy sources, even in terms of financial costs only. On the contrary, a recent Prognos study estimates that “new wind and solar can provide carbon-free power at up to 50 per cent lower generation costs than new nuclear”. Accounting for backup requirements in times without wind or sun, a combined system of wind, solar and gas is still 20 per cent cheaper than a system of nuclear and gas. Sure enough, Germany has to cope with the side-effects of the transition (e.g. current rises in retail electricity prices) and interactions with other developments (e.g. increasing electricity production from lignite mainly due to high gas prices and the record low emission allowance prices). Yet, nuclear energy is rarely an inevitable part of decarbonising energy provision. Until now, Germany’s political consensus is very solid in this respect – and while the transition effort is indeed challenging, this does not diminish its merits from an economic point of view: in the long run, it seems both sensible and feasible to phase out fossil and nuclear energies in favour of renewables, thus treading a long but well-considered path towards comprehensive sustainability of energy provision, including long-term cost-effectiveness. This post first appeared on LSE’s EUROPP blog and is reposted with permission. For more on this subject see the authors’ recent articles in Ecological Economics, Intereconomics and Nature and Culture. Sebastian Strunz (Helmholtz Centre for Environmental Research) was born in Munich, Germany, in 1981. He studied economics and political science at the University of Heidelberg. Subsequently, he has been a PhD scholarship holder and a research assistant at the chair for sustainability economics at the Leuphana University in Lüneburg. In 2011, he earned a PhD in economics. Since 2012 is a research fellow at the Helmholtz Centre for Environmental Research – UFZ, Leipzig. His main research areas are environmental and sustainability economics, currently within the Helmholtz Alliance “Energy-Trans”. The Price of Green Energy: Is Germany Killing the Environment to Save It? The German government is carrying out a rapid expansion of renewable energies like wind, solar and biogas, yet the process is taking a toll on nature conservation.